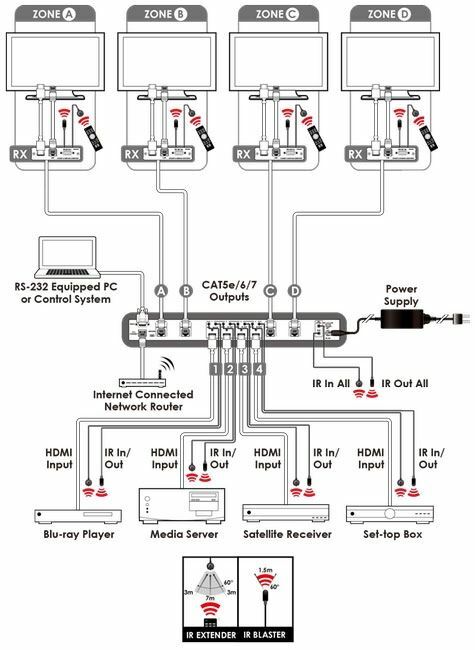 The 4 x 4 HDMI 4K UHD over CAT5e/6/7 Matrix supports the transmission of video (resolutions up to 4K2K and Full HD), multichannel digital audio and control via IR, RS323, Telnet or Web GUI from four high-definition sources to four HDBaseT™ outputs over a single CAT5e/6/7 cable (up to 100m at 1080p and 70m at 4K2K) for each output. It supports pass-through of high-resolution digital audio formats such as LPCM 7.1CH, Dolby TrueHD, Dolby Digital Plus and DTS-HD Master Audio as well as 3D content that can be displayed when connecting a 3D TV and 3D source. Additionally, the LAN connectivity will allow a 100BaseT network to be served to smart TVs or games consoles. The Power over Cable (PoC) function can power compatible Receivers, providing greater flexibility in installations.